Thursday we drove from Bremen to Evansville, Indiana. We were headed to the headquarters of SMI. 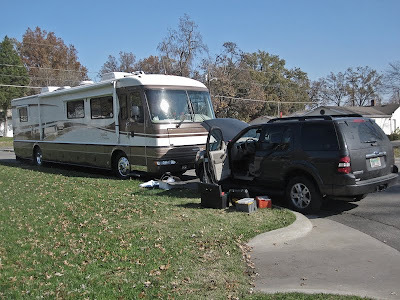 where we had an appointment to install a device that applies the brakes of our TOAD when the RV brakes are applied. We met these people at the fall FMCA rally in Bowling Green, Ohio. After reviewing several other systems we purchased their AIR FORCE ONE product. They claim you can install it yourself and include a training DVD. 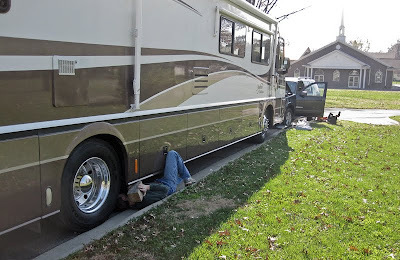 After reviewing the DVD, I knew I could handle the Explorer part, but the RV part was intimidating. With all the other problems we have dealt with the last couple of months we decided to let the pros handle it. When they gave us directions to their location, they said to pull into the church parking lot next to their business. They told us we could park there overnight. But they didn't tell us that this was where they would be doing the installation. This morning Kyle ( the owners son) came out with several tool boxes and went to work right there in the parking lot. Three hours later everything was installed, checked out, and we were on our way. I am very pleased and we would recommend their system. They also have dealers throughout the country that can do the installation. If we hadn't been headed in this general direction that's probably what we would have done. After a quick stop at the Bank of America in Mt. Vernon, IL we headed south and crossed the mighty Mississippi. It appeared to be at flood stage. We were fortunate to see a down bound tow going under the bridge right below us. Judy insisted that I keep my eyes on the road. She knows how much I love the river and all the work boats. It brought back memories of our 2 trips down the river and the one up. Unlike the canals in France that we enjoyed this last spring, this river is no place to relax. It can quite literally kill you if you don't respect it and the commercial traffic on it. 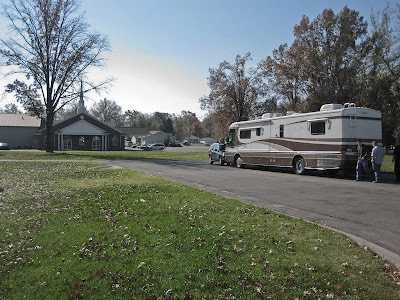 We pulled into our RV site for the night in Sikeston, Mo. and 20 minutes after we got hooked up we were driving to Lambert's. Our kids know this place well. We brought enough left over food back for tomorrow nights dinner. We need to be at MCD in McKinney, Texas on Sunday evening and Monday morning they will start on our window shades. Since we moved up our scheduled appointment they told us they may not be able to completely finish us next week. That's OK. We're happy they can start sooner. They have FULL hookups so it will be like staying in a campground.